I also love to make things which meant this was the perfect time to stretch my creative muscles. Luckily, I had a few partners in crime. 3 of my girlfriends and I went on a road trip to visit the new Hobby Lobby on my birthday followed by lunch at Fenton’s. What could any 42 year-old birthday girl like more than a morning of crafty inspiration followed by a super yummy lunch and amazing ice cream with like-minded friends? We picked up supplies and inspiration all over the store. 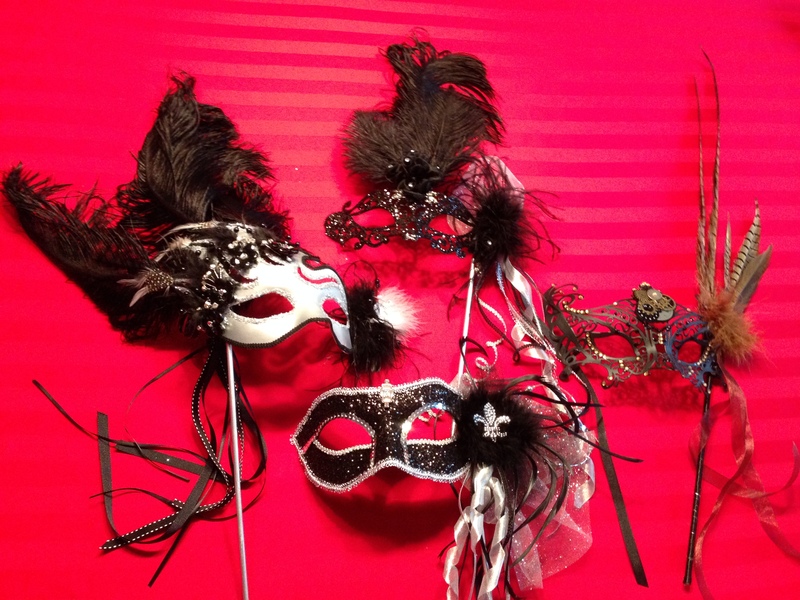 We met a few days later to put together the masks. 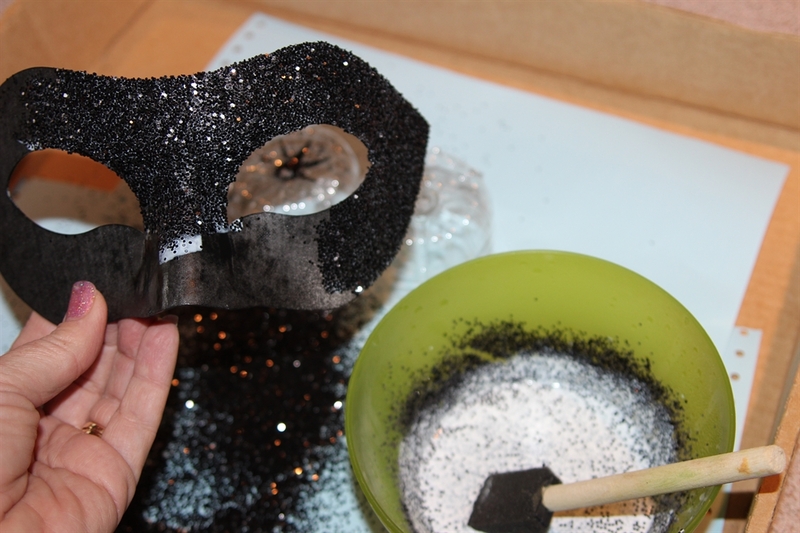 I did do a little bit of prep work to my mask as I wanted it to be glittered (a tremendous shock for anyone who has been reading my blog). 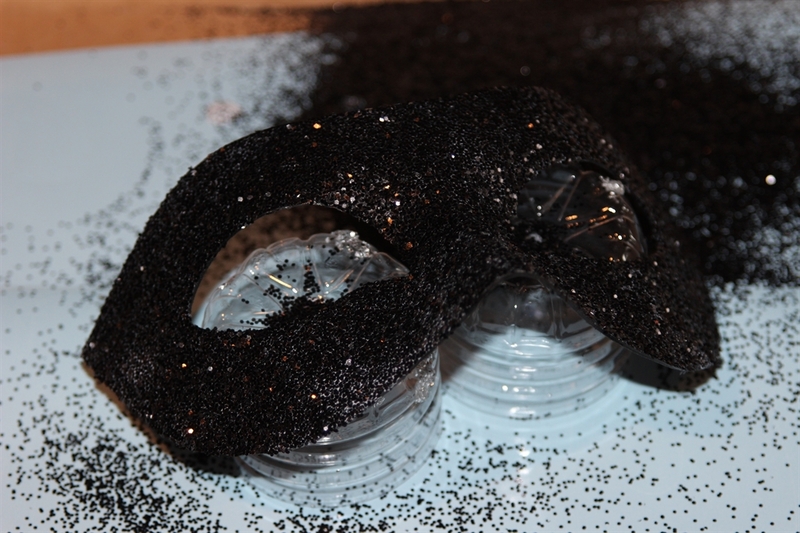 I also decided that the base should be painted black before I glittered it. My husband assisted by spray painting it with left over paint from a Pinewood Derby car. Think about the sizes and proportions of the different embellishments. I had to go back to the store for additional trim as I found the original ones I selected were all the same size. I used a rhinestone clip on earring for the embellishment at the forehead. Wish I had a bigger one, but I worked with what I had. Don’t be afraid to go big. In the end, I loved mine, but it was not as over the top as I would have liked. 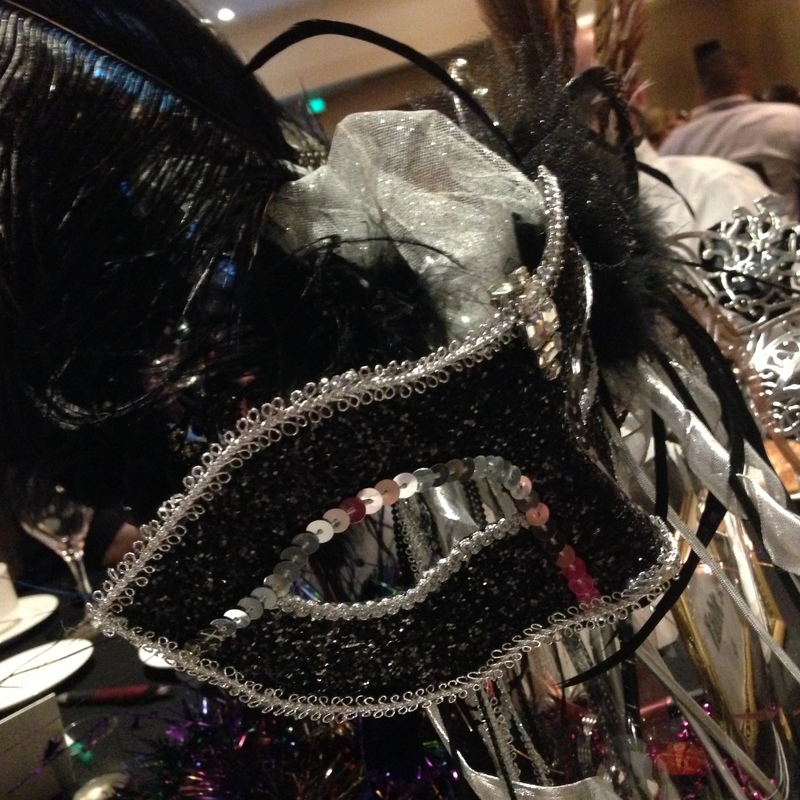 We brought a vase to the auction, so we had someplace to put our masks the night of the event. 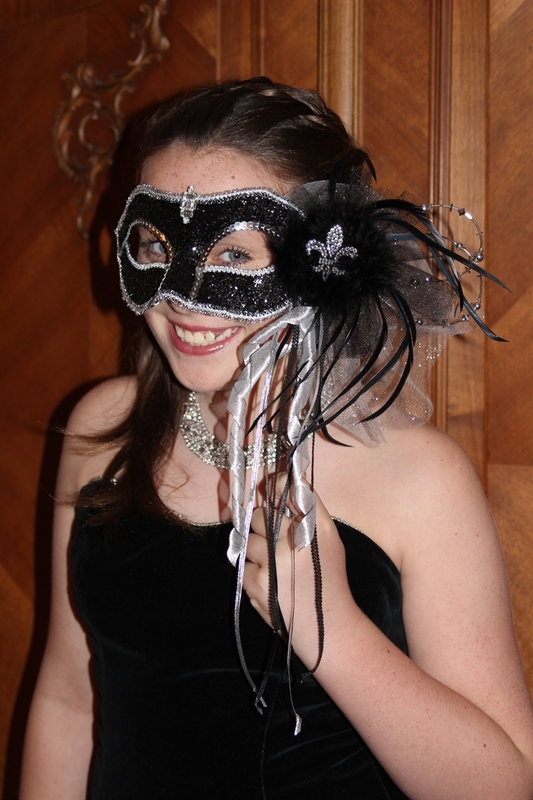 And finally, a better view of my mask as featured on the lovely face of my daughter dressed up in my old Senior Ball dress. 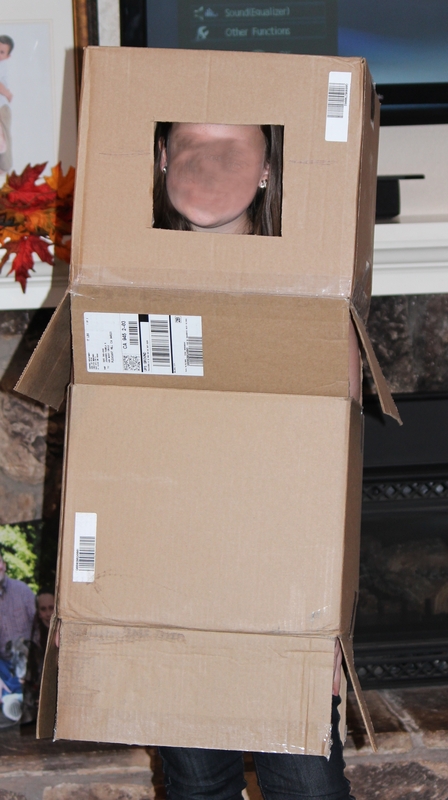 In my effort to be different, I ditched the color craze and made the dress myself. 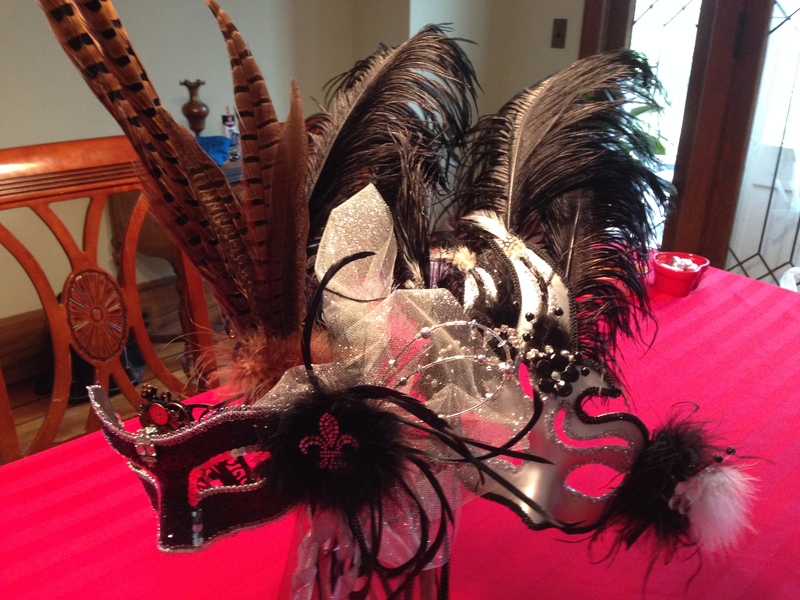 Categories: Costumes, Creativity | Tags: Glitter, mardi gras, mask, masquerade, Mod Podge | Permalink. I gave up something for Lent every year when I was growing up. For those of you not familiar with Lent, it is the 40 days before Easter in the Catholic Church. A time of waiting and preparing. Eventually, it became more popular to “do” something instead of “give up” something. Truthfully, I have not had my act together to even do that over the last few years, but this year I am going to make it happen. I’ve decided to make sure I take time to “do something crafty” each day. I was inspired by a woman at a quilt show a few years ago who quilted for 1/2 hour per day. Some days she did little projects and some days she did a little bit of a bigger project. I think I would be so much happier (which will make me a better person) if I took time to do this each day. Yesterday was the 1st day of Lent and I made a tutu. I will actually be doing quite a bit of this over the next few months as I am going to have a tutu booth at a vendor fair in May. This one is not totally done, so I have a little more work ahead of me tonight. This may actually be one of the first tutus I sell. A lady online said she was looking for some tutus locally and someone referred her to me. I would love to have some sales under my belt before I set up a whole booth of this delightful tullishness. I make my tutus fairly simply by sewing an elastic waistband and then tying on the tulle. 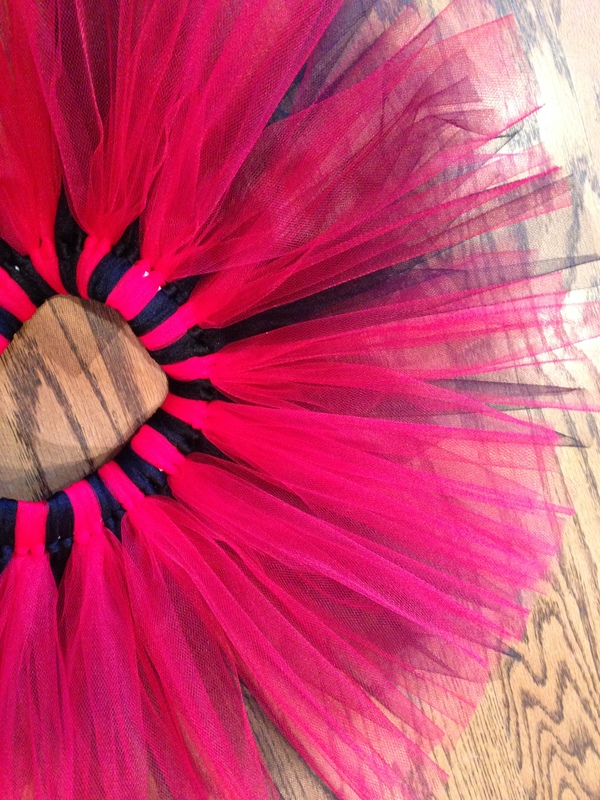 This particular tutu is kind of interesting because I did 2 red, 2 black, 2 red and so on. Depending on how you fluff the tulle, it can look mostly red (as it does in the picture) or black. How many tutus will I make for my booth? 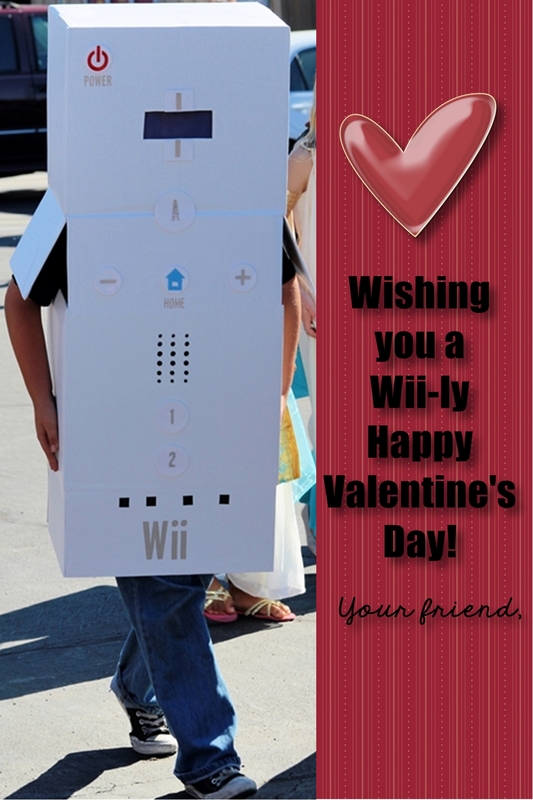 I am planning on about 100 (20 or so in 5 different sizes). Just like with my OCD cookie baking, I put together a spreadsheet of color combinations and how much tulle each size takes. I just ordered 85 – 100′ rolls of tulle from my favorite website, Papermart. Who doesn’t need 8,500 yards of tulle lying around their house?!??!?! Can’t wait to update you on my progress! 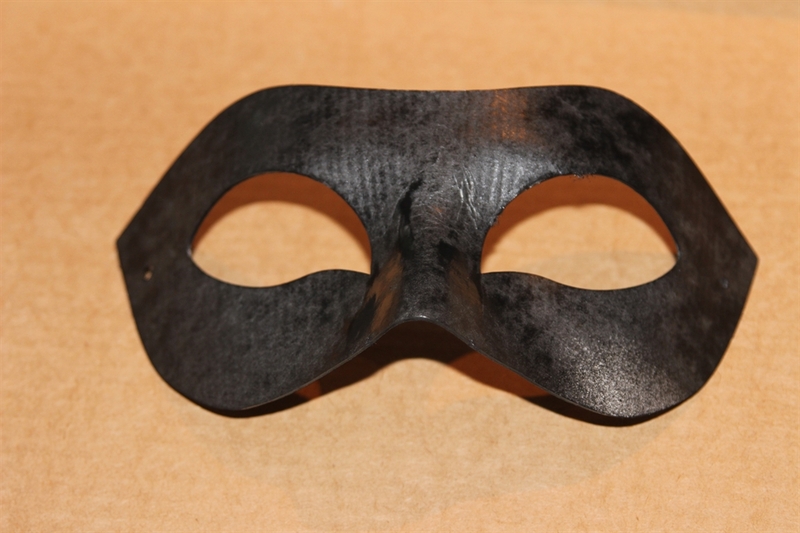 Categories: Costumes, Creativity | Tags: creative create crafty, lenten crafting, papermart, tulle, tutu | Permalink. Well, I originally made the following project as part of a Dorothy from the Wizard of Oz Halloween costume (more my costume creations later because I ROCKED my son’s first ever request for a homemade costume) for my daughter, but they didn’t end up getting used and now they are Mommy’s holiday fun shoe! 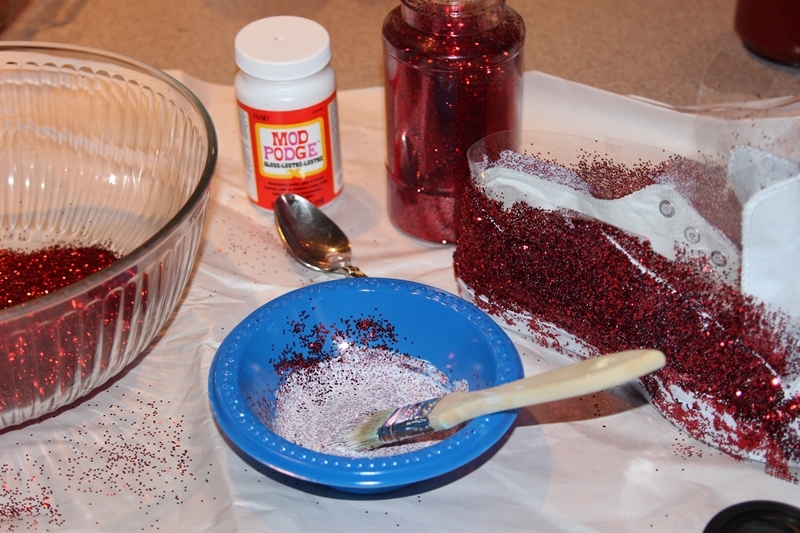 This was my first foray into Modge Podge and glitter and I have to say I was HOOKED! 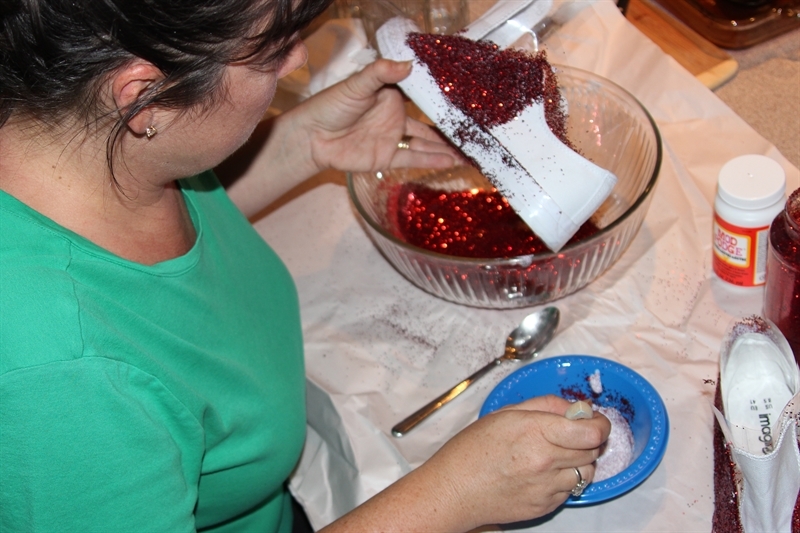 Then I mixed up some Mod Podge, a little water and a bunch of glitter in a bowl. 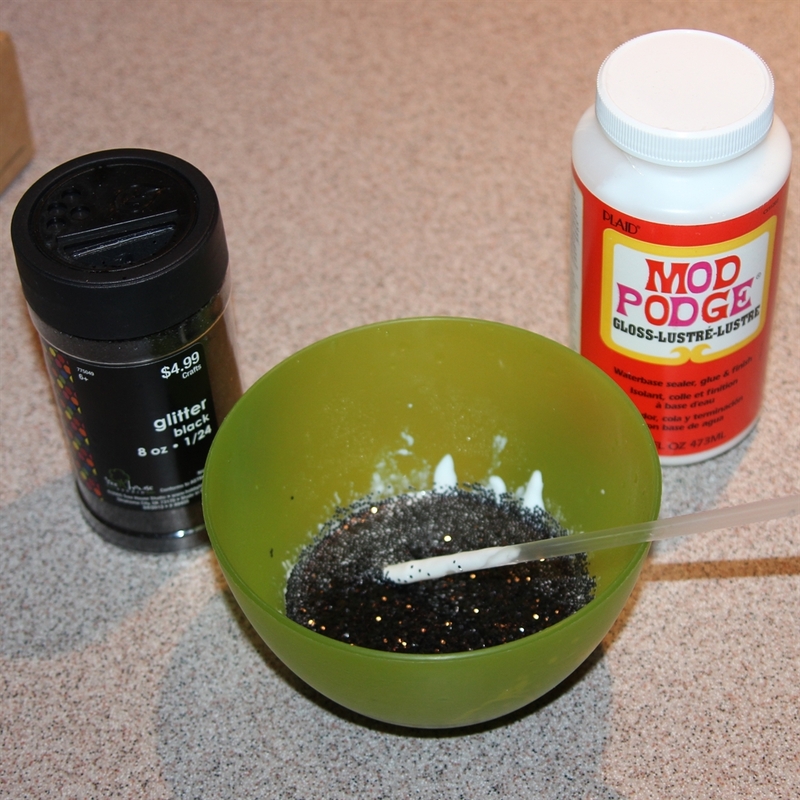 Adding glitter to the Mod Podge gives you better coverage in the long run. 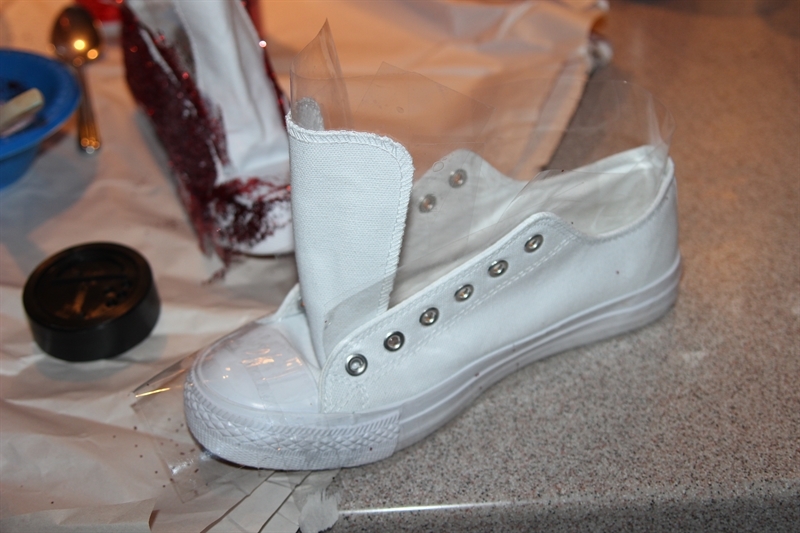 Then you just start “painting” your shoe with that mixture. 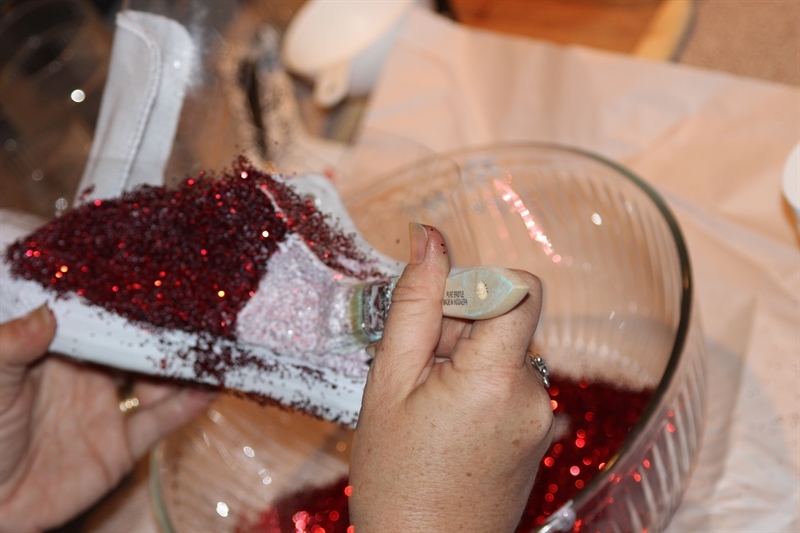 After I would paint a small section, I would hold the shoe over the other bowl and pour more glitter on it. Keep going until the whole thing is covered. 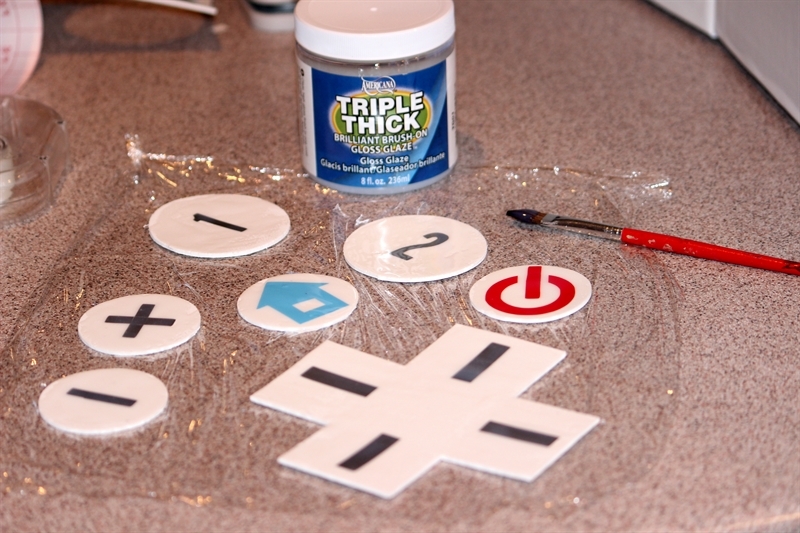 Let it dry and remove the tape. Enjoy your cute new shoes. 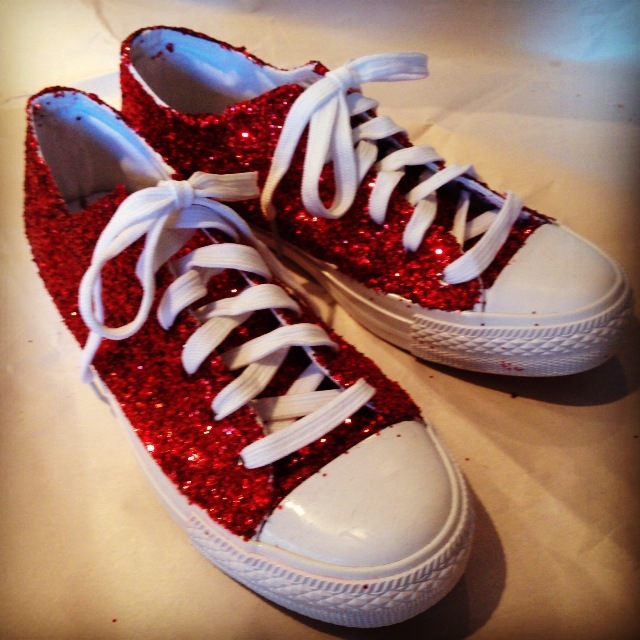 Categories: Costumes, Creativity, Holiday Fun | Tags: can't get enough glitter, Costume, Dorothy, Glitter, Halloween costume, Mod Podge, Red, Sparkly Shoes, Wizard of Oz | Permalink.